Commentary: Resistance is a show that leans heavily on mentors and learning - our lead is, to say the least, green in many ways. One of his minders is Jarek Yaeger, an old guy that runs a repair business for the ships racing on a water planet with seemingly no audience and no economy of which to speak so far. There are people selling ship parts, but really, what's going on there? 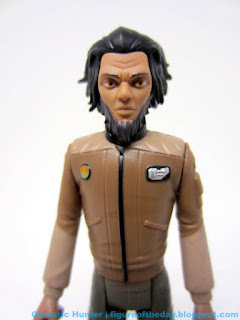 Maybe it has been addressed and I missed that episode - but Hasbro did study the character designs well, translating the oddly flat 3-D designs into action figures that sometimes look more lifelike than their on-screen counterparts. Jarek Yaeger is skinny, matching his animated counterpart quite nicely. 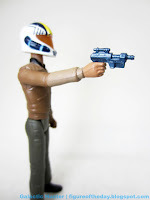 He has a blaster - which I don't believe sees a lot of use on the first few episodes on the TV show - and a helmet. 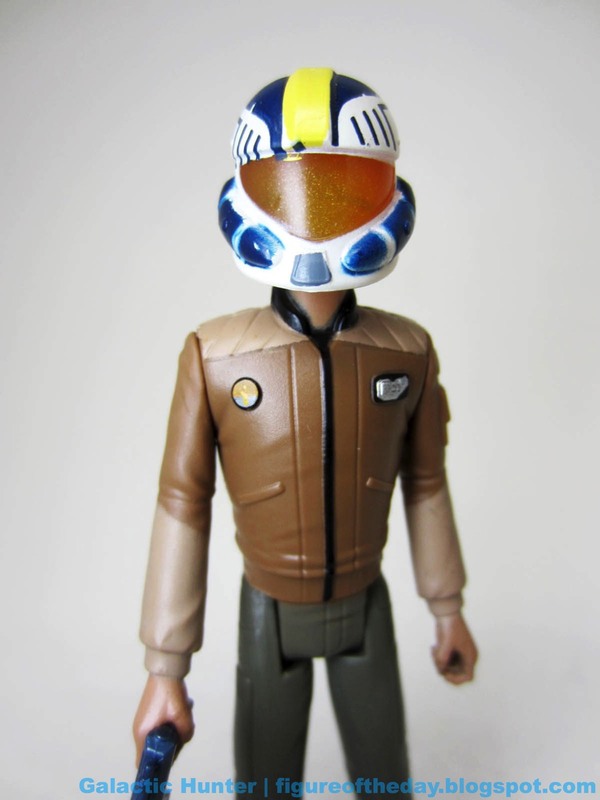 The helmet is actually a swappable alternate head, with a clear orange visor as his hair would not allow for a helmet over it. I don't believe he's used the helmet much on the show as of yet either, but then again, a lot of the first wave of figures weren't regularly appearing on the show. 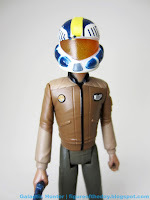 Hasbro's figure is a bit more lively than Kaz, with more wrinkles in the jacket and pants. This looks like a slightly more living person, with subtle wrinkles and good facial features. I was surprised to notice glossy lips and eyebrows, possibly making this an early experiment in "real" faces. Hasbro has been promising those printed-on mugs in the small size, and in this case I would say it could be a challenge to do better. The eyes are lips are where they should be, and to the naked eye look superb. A few ornaments on his jacket aren't just painted, but outlined in black so they pop nicely. He has 5 points of articulation and has no problems sitting, although standing will require you to find his center of gravity. I admire what Hasbro did with these figures - they feel a lot more like old Kenner figures thanks to their proportions, poses, and articulation. My compliments to the chef. 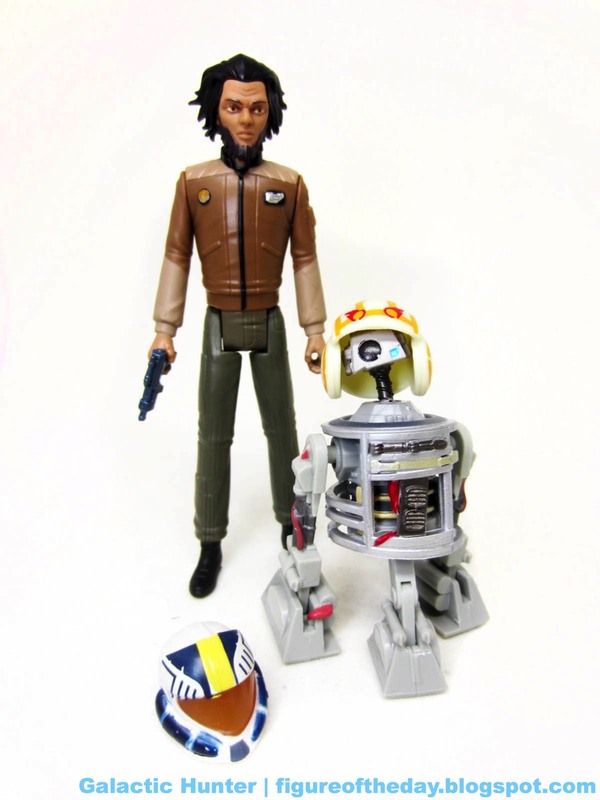 This set is worthwhile in that you get a perfectly good human character with one of Hasbro's best animated small-scale heads along with one of their most wonderful droid figures in recent memory. It's absolutely worth picking up if you can find one.